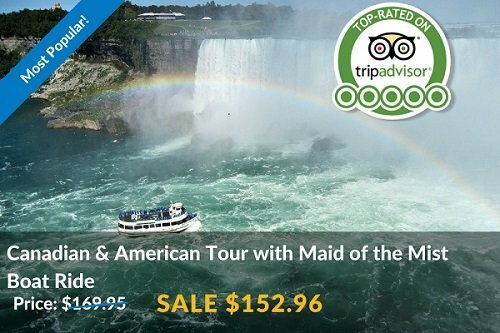 6-7 hour sightseeing tour of Niagara Falls Discover both the American side and Canadian side in one tour! 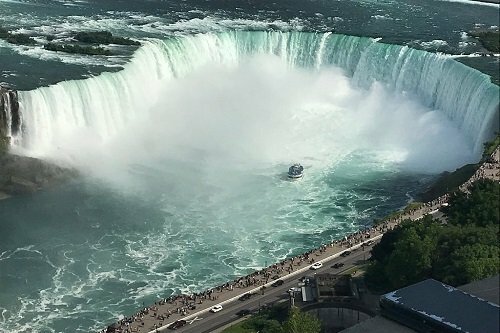 You’ll experience the best of both world’s through our Niagara Falls Canadian and American Tour with Maid of the Mist Boat Ride which features just about something for everyone. 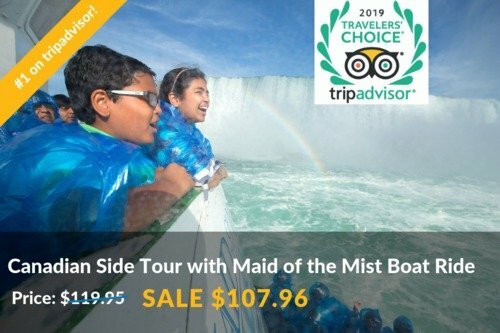 You’ll sail into the middle of Niagara Falls aboard the historic Maid of the Mist, journey through the breathtaking Cave of the Winds and Visit the oldest state park in the USA. 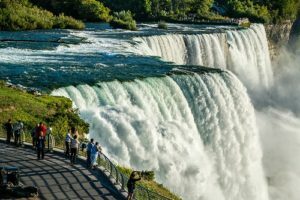 After sightseeing through the American side you’ll make your way into Canada where you’ll scale the 520 foot high Skylon Tower for the most sweeping and captivating vista views of both Niagara Falls USA and Canada. 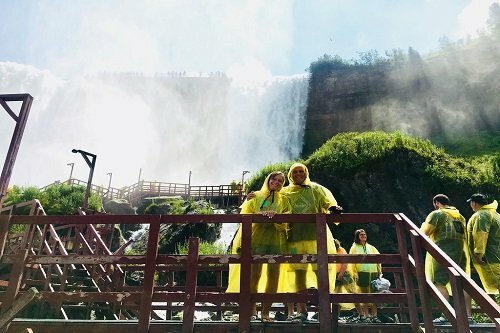 You’ll travel along Niagara’s mighty River Gorge, catch spectacular views of the falls from the Canadian side, learn the history of Niagara Falls and so much more! 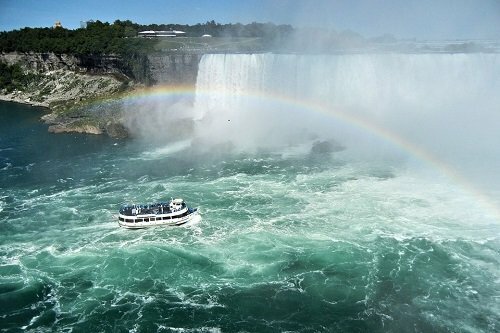 This all-time guest favorite tour is guaranteed to thrill whether it be your 1st or 15th time visiting Niagara Falls. As a courtesy, we encourage all of our guests to bring a camera. 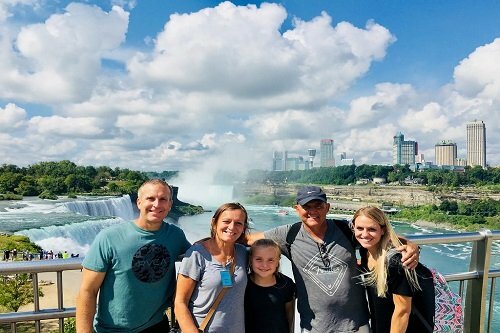 Not only do our guides love having their picture taken, but this way you can capture each incredible moment in order to share your personal adventure with friends via social media, or with family back home. For the best experience possible, we personally recommend wearing comfortable clothing and walking shoes while on tour. Pickup Times: Times vary 48 hour confirmation required. Passenger(s) have up to 24 hours prior to their scheduled tour time to call and cancel their tour with no penalty incurred. Click here for our cancellation policy. 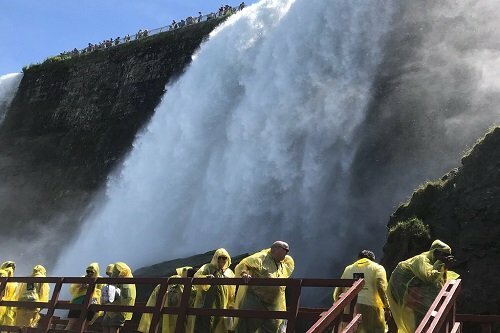 Check Out Our Other Popular Tours! 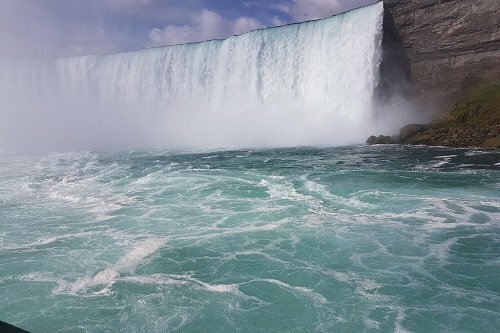 If you like what you see, don't hesitate to book your seats with the top rated tour company in Niagara Falls! 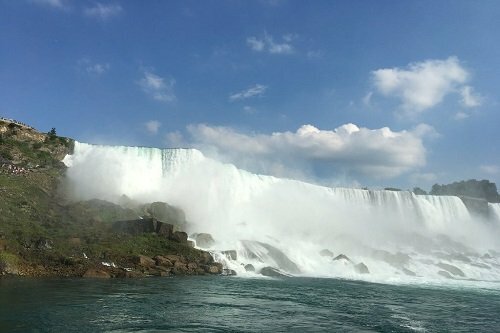 Looking to do an off season tour? Check out one of our winter tours! 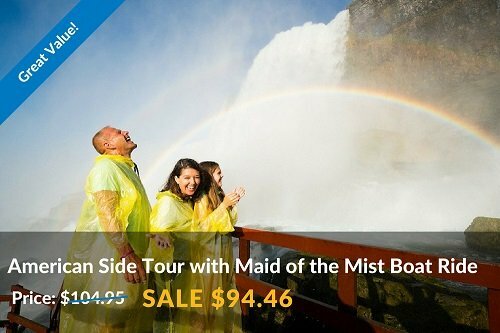 You’ll experience the best of both world’s through our Niagara Falls Canadian American Tour with Maid of the Mist Boat Ride which features just about something for everyone. 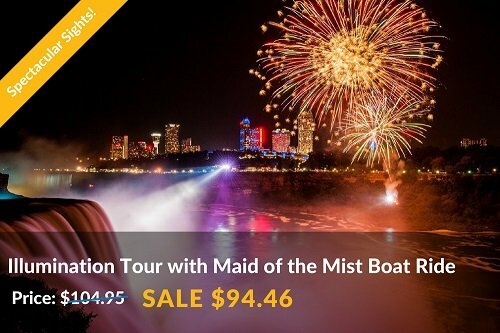 On this tour you’ll sail into the middle of Niagara Falls aboard the historic Maid of the Mist, journey through the breathtaking Cave of the Winds and Visit the oldest state park in the USA. 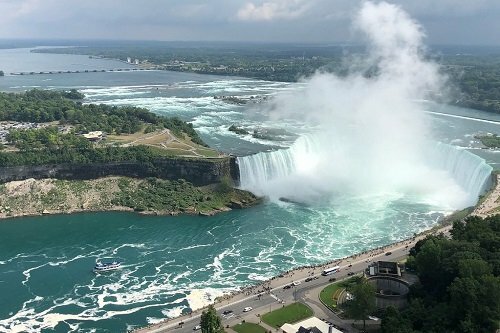 After sightseeing through the American side you’ll make your way into Canada where you’ll scale the 520 foot high Skylon Tower for the most sweeping and captivating vista views of both Niagara Falls USA and Canada. 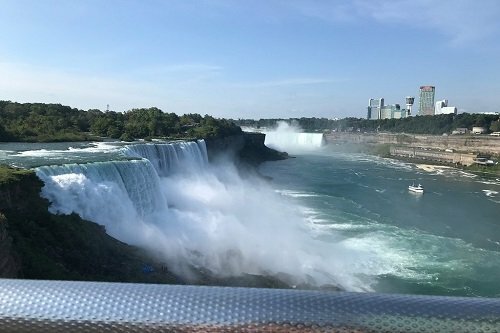 You’ll travel along Niagara’s mighty River Gorge, catch spectacular views of the falls from the Canadian side, learn the history of Niagara Falls and so much more! 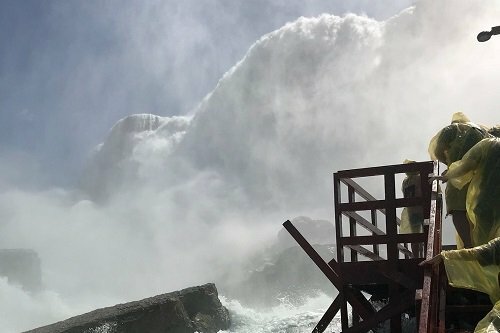 Please note: The Maid of the Mist tour departs from the U.S. side of Niagara Falls. 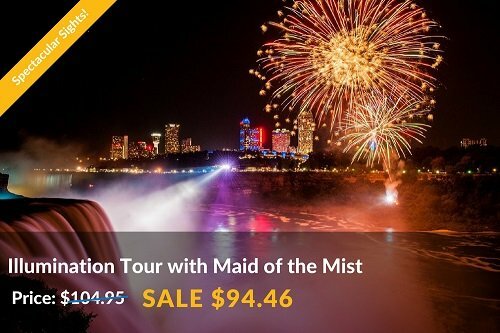 All customers booking this tour must have appropriate documentation to enter the United States and Canada. Valid Passports Required, Click border crossing document to find out more.